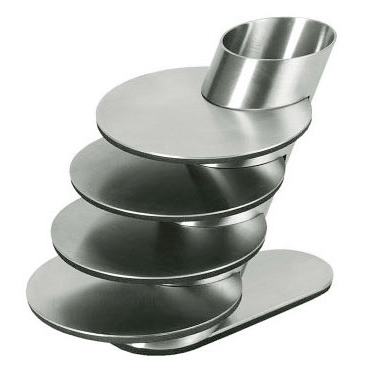 It looks like a space-car part out of the Jetsons, or perhaps a board game from Star Trek, but this shiny contrivance is actually a five-piece coaster set. The Coaster Set with Rubber Base and Stand may take up a fair amount of room on your living room table (each coaster measures four inches), but it is sure to act as a conversation starter; consider it an icebreaker before breaking out the real ice. When the drinks finally do hit the table, the stainless-steel coasters along with the rubber bases will keep your table top neat and tidy and free of Saturn’s rings.